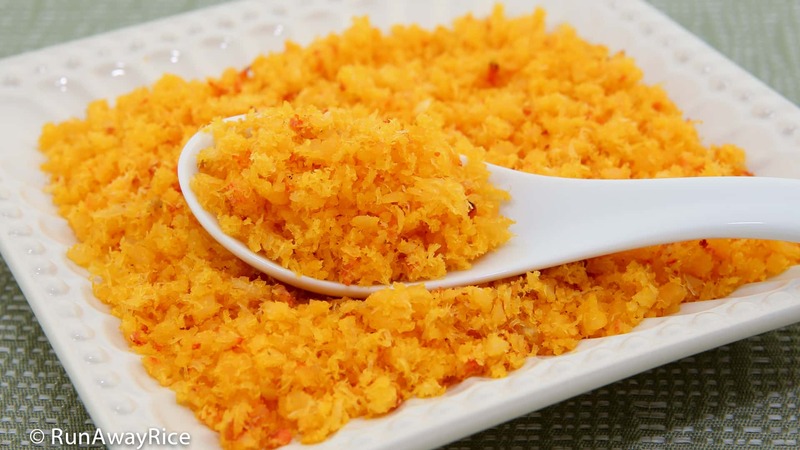 This easy recipe for Toasted Shrimp Flakes (Tom Chay) uses fresh shrimp to make a delectable and fluffy topping for savory dumplings, cakes, noodles, rice dishes and more. Many recipes use dried shrimp, which is convenient, but fresh shrimp is so much more flavorful. Using tiger shrimp yields the best results because they are so plump and meaty. When cooked, the color is a beautiful orangey-pink. These Toasted Shrimp Flakes are so deliciously briny and fluffy. Sprinkle on whatever foods you like. 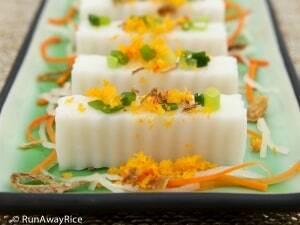 It goes great with everything like this dish: Steamed Coconut Rice Cake with Toasted Shrimp Flakes (Banh Duc Tom Chay). I prefer tiger shrimp but any size shrimp will work just fine. Adjust the cooking time accordingly. If using frozen shrimp, thaw completely first. Some people prefer to cook the shrimp with the shell on. This is works great and helps to not over-cook the shrimp. Peel the shrimp after they are put in the ice bath. The ice bath helps to cool the shrimp down quickly. If hot shrimp is processed, it will turn into a paste. Use a food processor or a mortar and pestle to shred the shrimp. The food processor gets the job done super fast. The mortar and pestle is a bit laborious but will result in really nice shreds. Pulse the shrimp and don’t process continuously or it will turn into a paste. 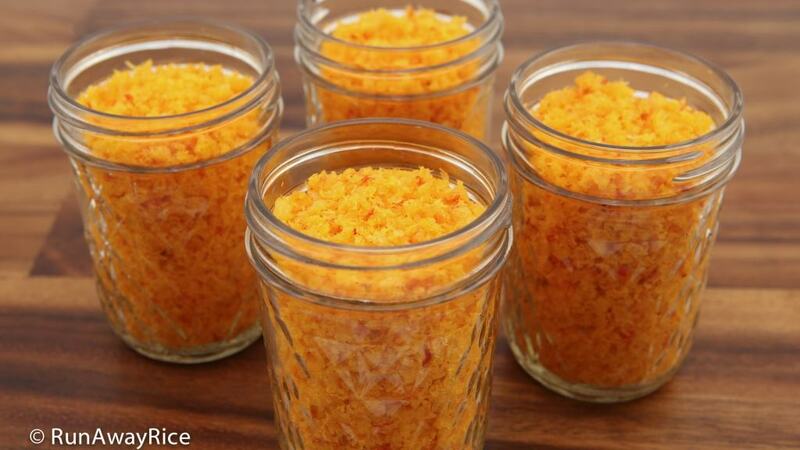 Store any remaining amounts in air-tight jars or containers. Store in the refrigerator for up to 1 month or in the freezer for up to 3 months. Transfer the shrimp into a large skillet. Add the water. Cover the skillet. Cook on Medium heat for 1 1/2 – 2 minutes or until the shrimp is pink on the underside. Flip the shrimp over. Cook until pink, another 1 1/2 – 2 minutes. Transfer the shrimp to an ice bath and let soak for 2 minutes. Drain well using a colander. Blot the shrimp dry using paper towels. Transfer half the shrimp into a food processor. Pulse for 20-30 seconds. Transfer the shrimp into a large non-stick skillet. Repeat the same steps with the remaining shrimp. Cook over Medium heat for 3-4 minutes stirring constantly and letting the moisture evaporate. Add the annatto oil and combine well. Using a spatula, press down on the shrimp and rub it against the skillet. Continue this process while cooking for another 5 minutes or until the shrimp is fluffy. Add salt and ground white pepper and combine together. 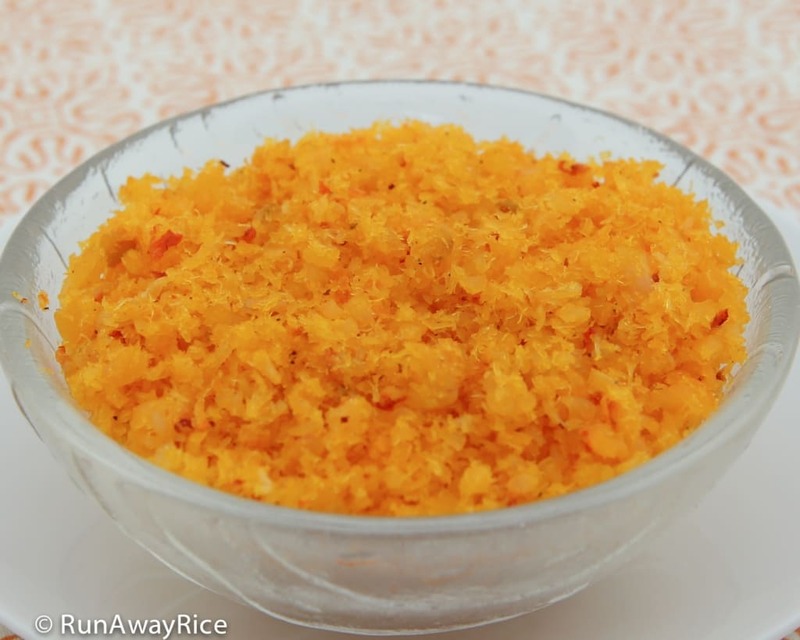 Sprinkle the Toasted Shrimp Flakes over rice, noodles, soups, savory dumplings and cakes. 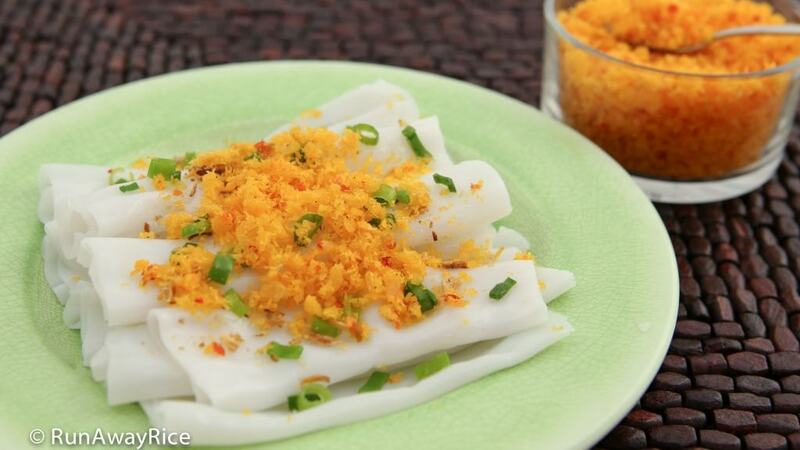 Rice Cake topped with Toasted Shrimp Flakes: this scrumptious dish can be made using the batter recipe in Savory Rolled Cakes (Banh Cuon). The cake is made without the meat filling and topped with a generous amount of Toasted Shrimp Flakes and Scallion Oil (Mo Hanh). 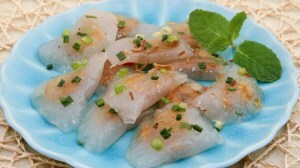 Serve with a Fish Sauce Dipping Sauce (Nuoc Mam Cham) for a simple yet tantalizing dish. This easy recipe for Toasted Shrimp Flakes uses fresh shrimp to make a delectable and fluffy topping for savory dumplings, cakes, noodles, rice dishes and more. 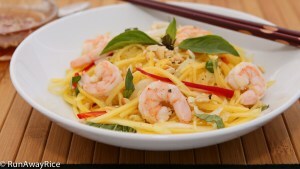 Many recipes use dried shrimp, which is convenient, but fresh shrimp is so much more flavorful. Using tiger shrimp yields the best results because they are so plump and meaty. 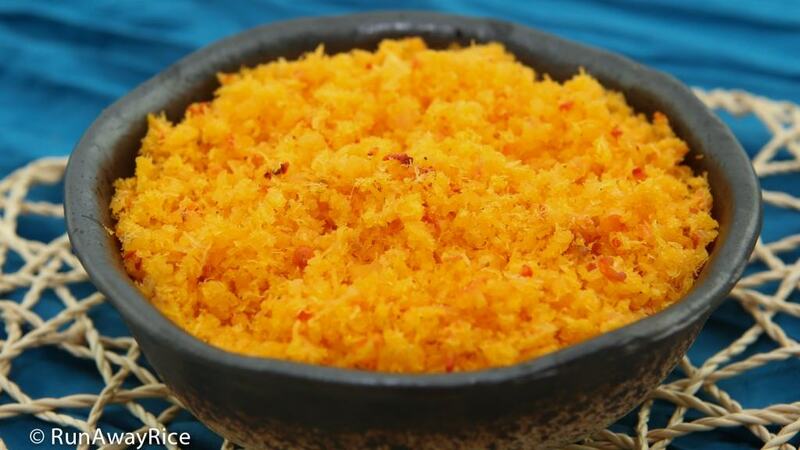 When cooked, the color is a beautiful orangey-pink. These Toasted Shrimp Flakes are so deliciously briny and fluffy. Sprinkle it on whatever foods you like. It goes great with everything! Transfer the shrimp into a large skillet. Add the water. Cover the skillet. Cook on Medium heat for 1 1/2 - 2 minutes or until the shrimp is pink on the underside. Flip the shrimp over. Cook until pink, another 1 1/2 - 2 minutes. Any size shrimp will work just fine. Adjust the cooking time accordingly. If using frozen shrimp, thaw completely first. Use a food processor or a mortar and pestle to shred the shrimp. The food processor gets the job done super fast. The mortar and pestle is a bit laborious but will result in really nice shreds. Pulse the shrimp and don't process continuously or it will turn into a paste. Glad you enjoyed the recipe Lynn! This is great! I needed these for a recipe this weekend and they worked out perfectly!